The Most Fun we have had in ages. 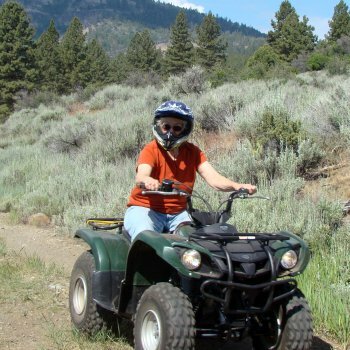 This four wheelers tour in the Sierra Valley is set in fabulous scenery, a 360 degree view, Oaks, Aspens, and Cedar trees. 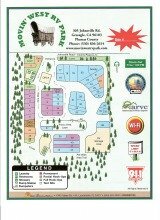 While riding these off road trails you see Deer and many historical sights. There are Wild Flowers in the spring, fall colors late in the year, and the meal waiting for you at the end is the topping to a great ride. We arrived at the Diamond S Ranch early on a beautiful summer’s day. Temperatures were just right, blue skies with big puffy white clouds floating overhead. We were greeted by Ken and Kathy Smith owners of Explore! Sierra Touring Company. Great Folks, who did everything they could to make our quad tour a memorable Day. The day started with a tour of the Ranch barn, which is an old post and beam Structure that has been on site since the beginning of the ranch. The barn has no nails in the post and beam framework it is all mortise and tennon joints, joined together with wooden pegs. The Smiths have turned the barn into a museum of old ranch related artifacts. It is fun to look at this collection that Ken's Mom and Dad have put together over the years. If you get the chance to meet Jim and Maylou, Kens Parents, Ask them to tell you about the barn and the life they have led on the ranch for the last 35 plus years. They have stories! Since Ken spent a few years growing up on the ranch, he has a few tales as well. 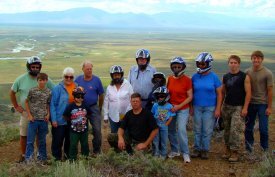 Next the ride, get your helmet, have an ATV assigned for the ride, and take a short training course in how to handle the Quad safely, then hit the off road trails. Now you will have a true four wheelers experience. 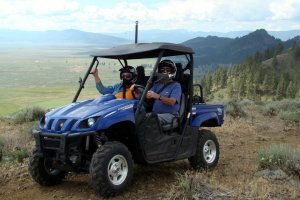 Taking a ride in the rhino is also a great way to enjoy the trails. If driving a quad is not your thing, consider seeing the sites from this cushioned ride. The sites are worth it. The motor is running, the 4wheeler is in gear, Ken or one of his able assistants takes the lead out of the barnyard. 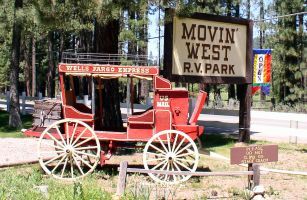 Push the gas and follow out onto the off road trails that have been cut through this 1600 plus acre ranch, you will travel approximately 15 miles over the next two to three hours. It is time to have fun and see all the sights. 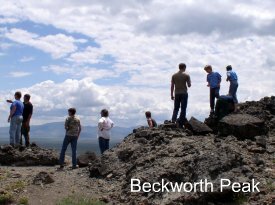 There are several historical sites, some interesting rock formations, and just spectacular views that you will stop to see while on the ride. Don't worry this is not a hammer fest to see how fast you can ride the trail, this is a real tour. Don't forget to bring your camera, photo ops abound. Our group had ages from six to seventy-four, both girls and guys and we had a great day. 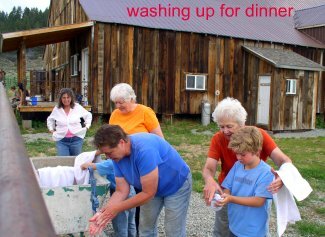 When you return to the ranch wash off the dust, listen for the dinner bell and get some of the great Santa Maria style Barbecue. You will be hungry and they feed you well. We really encourage you to take a few minutes to fill out the form below to get information on how you to can enjoy this tour. This is a fantastic adventure. It is amazing how much local history there is on the ranch. 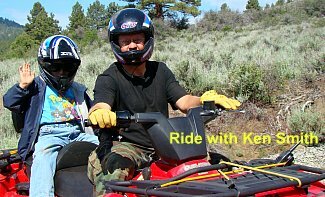 Ken and Kathy make you welcome from the moment you arrive until you finish the fabulous barbecue at the end of the ride. They are truly hosts with the most. This is a don't miss event.